Ross McCormack's double strike inspired Cardiff City into the play-off zone as they beat nine-man Charlton 2-0. 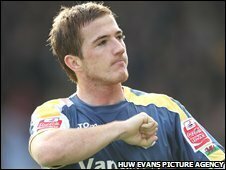 McCormack's ninth goal of the season was a 20-yard free-kick after he was fouled by Jose Vitor Semedo, who was sent-off four minutes after coming on. Charlton also lost Mark Hudson, red-carded for a second bookable offence. "I can't have many complaints from that game and once we got our noses in front we had to be professional and see the win out. "Tom Heaton's save from Luke Varney five minutes before our first goal was important. "The crowd wanted us to start flying forward when they went down to nine men, but we can't just go gung-ho and risk surrendering a win which happened to me once when I was Southampton boss playing against nine-man Derby. "I learned a lesson that day, so I shut up shot because I'd rather a half-entertaining comfortable 2-0 win than a thrilling 2-2 draw." "It was two tough decisions by the referee and then game was over then. All we had left was character. When it as 11 v 11 we were the better side. "But the breaks didn't go our way and fortune didn't favour us. The referee's decisions were tough on us. We tried to keep our head as we could have lost more players. We were frustrated by the events that went on. "I thought we had a bit of cover with Semedo's sending-off and it was tough on him. He was distraught. "I didn't think Hudson should not have gone either. It was a harsh booking and then Jay Bothroyd did us no favours as he hardly touched him. "The referee had no hesitation in sending him off. He booked people for innocuous challenges all day but you could say he was consistently bad. I will have a chat with the referee." Cardiff: Heaton, McNaughton, Purse, Roger Johnson, Kennedy, Rae, Whittingham, McPhail, Parry (Comminges 84), Bothroyd (Eddie Johnson 90), McCormack. Subs Not Used: Enckelman, Gyepes, Blake. Charlton: Weaver, Youga, Hudson, Cranie (Semedo 46), Primus, Bailey, Holland, Ambrose (Sam 84), Bouazza, Gray (Basey 68), Varney. Subs Not Used: Elliot, Todorov. Sent Off: Semedo (51), Hudson (67).